FORT LAUDERDALE, Fla. — Gov. 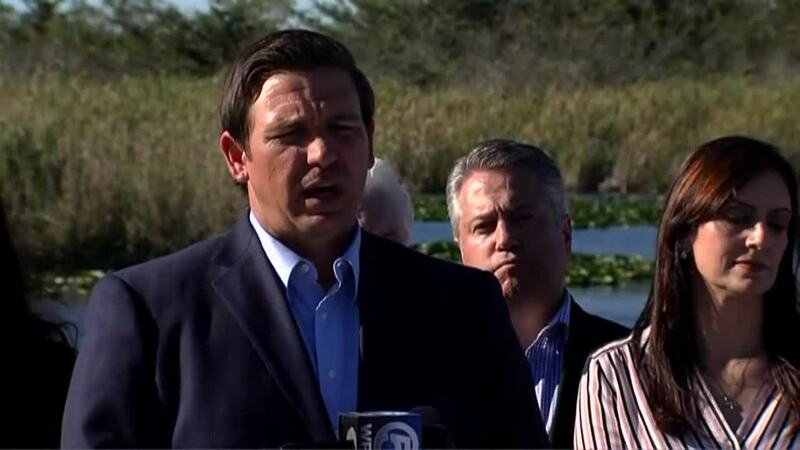 Ron DeSantis outlined his environmental protection plan on Tuesday during a visit to South Florida. He revealed his proposed $625 environmental budget at Everglades Holiday Park in Fort Lauderdale. "When people throughout the state of Florida see that we need to take these actions to support enhanced water quality and build the infrastructure we need, I think it's something that really resonates throughout the state," said Gov. DeSantis, who called this a historic commitment. "I'm hoping we get a groundswell of support in the Legislature to be able to push this through." The Governor also nominated "Alligator" Ron Bergeron, a wildlife conservationist, to the South Florida Water Management District Board. Earlier on Tuesday during a stop in Naples, he nominated Chauncey Goss to the board. Goss is a council member on Sanibel on Florida's Gulf Coast. Earlier this month, Gov. DeSantis called for the South Florida Water Management District board to resign during a visit to Stuart. When the Governor took office in early January, he said the environment was a top priority for him. "We will fight for our beaches, we will fight discharges, we will fight red tide, we will fight toxic blue-green algae blooms," Gov. DeSantis at his inauguration. "If our environment is threatened, I will move to protect it."